“Aizome” has splendid beautiful color and design! It’s Japanese traditional dyeing. “Tenugui” is popular as a typical Japanese souvenir, isn’t it? There are various kinds of tenugui and among them, especially the one “aizome” (dyed with indigo) is very popular for its beautiful color and design. Then how is the way of aizome? “Aizome” is the way of dyeing blue to dark blue by indigo contained in plants. There are a lot of plants which contain indigo all over the world, and it has been the popular way of dyeing since old days. 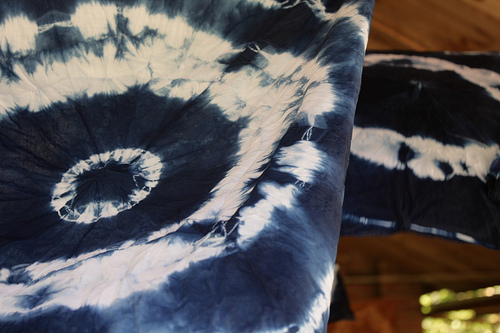 The famous ones in the world made by dyeing with indigo are jeans which are born in the US. At the time of gold rush, people dyed working trousers with indigo to prevent them from being bitten by rattlesnakes and this is the origin of jeans. Also in Japan, it is said that if you wore the colothes dyed with indigo, the insects will never come close to you. But to my regret, both ideas are superstitious and have not proved scientifically. Now the jeans are mass-produced, so indigo from plants is not used but pure indigo dye synthesized from oil is used. Aizome is famous for its specific and beautiful design. There are various kinds of designs in it and the way of making each of them are unique and interesting. 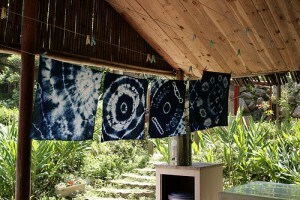 Among various designs, the one first dyed is called “shibori”. 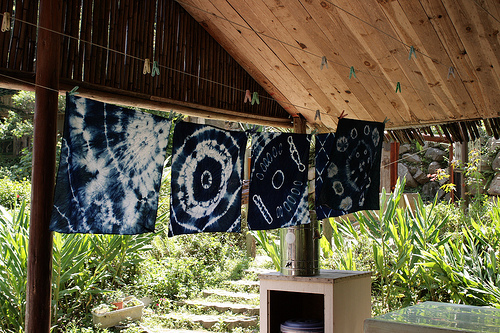 To make “shibori”, make a design like a white circle in a cloth dyed blue. The way to make that white circle is to tie at the point you want to make it with a rubber band before you put the cloth into the dye and then start to dye it. Then the part you tied will not dyed and become a beautiful white circle. If you want to make double or triple circles, tie it with two or three rubber bands applying side by side. If you used a rope instead of a rubber band, it will make more interesting design. In addition to it, there are othere ways like wrapping a ball or a marble with the cloth and tie it. Compared to the way without a ball or a marble, the white circle will become larger and bolder. There is even a way to tie a pumpkin. The design will differ according to the thing you wrap. You can do “Aizome” easily at home. Recently anybody can try aizome simply as a handy aizome set is sold in a store. And there are also many studios where you can experience aizome, so it will be good to go there when you come to Japan for sightseeing! Bento ｜ What is this global bento boom?